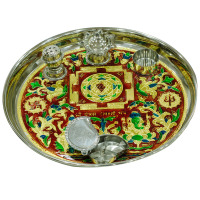 Enhance your devotion with this gorgeous marble puja thali with chopra. 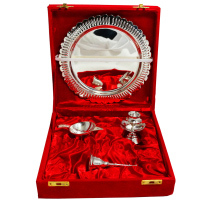 The red velvet packing box that also holds the accompanying spoon enhances this beauty manifold. 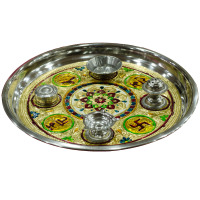 Enhance your devotion to the almighty with this beautiful marble puja thali with chopra. 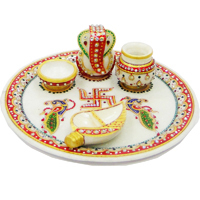 The beautiful design of self lapidarian ethnic patterns that adorn the complete plate sets simply the correct mood for a spiritual giving. 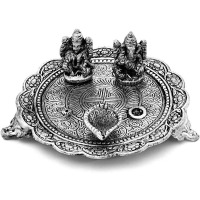 The unbelievable trying pooja thali, made of change silver, is simply the correct factor to form your home worship excellent. 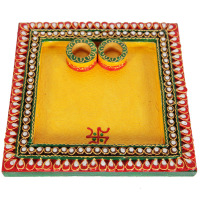 The plate is decorated with beautiful bead and lak work around the edges and features. 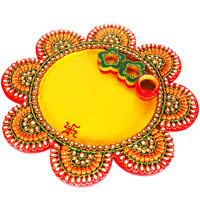 Furthermore, beauty of the plate is enhanced by the green and red beads of different shapes placed on a golden background that adorn the circular border of the plate. 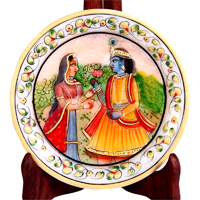 Superbly adorned with artistic minakari and bead work, the marble plate along with all its marble adornments and bold artwork is designed to set the right mood for a religious offering. The beautiful portrait of Lord Ganesh’s head just above the centre along with the intricate design that borders the circular plate gives it s truly ethnic and religious look. 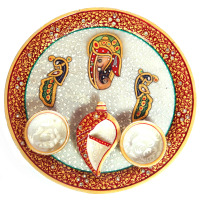 The beautiful artwork of Lord Ganesha’s head in the upper half of the plate along with the use of the pious colors of red, saffron and green over a white background sets the right mood for a religious offering. Diwali, the festival of lights, is one of the popularly celebrated festivals in India. The preparation of Diwali begins five days in advance. In Diwali, there is a tradition of cleaning homes, shops, offices and adorn them with beautiful flowers & colourful lights. Every year, Diwali falls on the 15th day of Kartik, the holiest month in the Hindu lunar calendar. The festival of lights indicates the triumph of light over darkness, good over evil and happiness over sorrow. The festival of Lights is celebrated worldwide with great enthusiasm and fun. Preparations for Diwali begin from days in advance. The five-day celebrations begin with Dhanteras and is concluded with Bhai Dooj. On the third-day people collectively participate and partake in the celebrations of Diwali. Diwali is a festival for all; it increases the love in people, build relationships stronger and develop unity. Along with the glare of sparkling lights and fireworks, distributing sweets & gifts among friends & family, there are some other subtle aspects of Diwali which one should understand to appreciate the festival of Lights. But many of us don't know they why Diwali Pooja holds great importance. The two deities Lakshmi and Lord Ganesha being worshipped together, on Diwali. Not because it is a ritual, but there is a valuable meaning in worshiping them together. Worshiping them has deep meanings. In today’s world, people entertain themselves with material success - wealth makes them happy and satisfy their needs. This is the reason traders and business traditionally worship Laxmi and Ganesha as they identical to happiness and wealth. People also close their old account books and open new ones for the year - the symbolic tradition of a fruitful financial start. Moreover, Ganesha role of Diwali is also prominent. Ganesha blessed with knowledge and wisdom. They have divine powers and help the needy. Worshiping Lakshmi-Ganesha together bring happiness, intelligence, power and wealth in a family. God also talks to us is a subtle language. It’s up to us how we understand their signs and implement them. Doing Diwali pooja with beautiful Pooja Thalis also holds great importance. 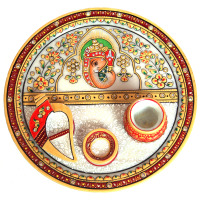 A Pooja Thali is a tray in which the entire pooja materials get accumulated and decorated. In Indian tradition, every festival like Raksha Bandhan, Bhai Dooj, Diwali etc. 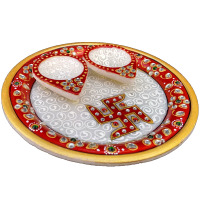 must have pooja thali that is decorated with mirrors, ghoota, red cloth and much. 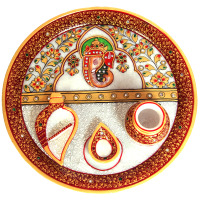 As depending on the festival, the role of pooja thali to differs. 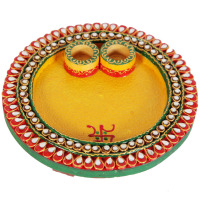 In Diwali, a pooja thali is used to worship Gods, in Rakshaban, sisters used pooja thali for their brother for the well being. 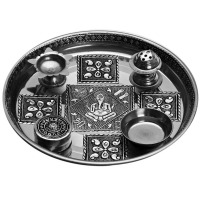 A Pooja Thali to comes in different shapes and materials. Here is a list of all the different materials which you can opt for Pooja. 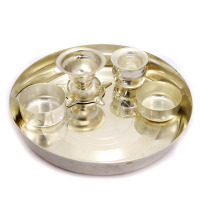 Steel: From plain to engraved, use any steel thali that works well for you. Brass: Most widely used material for spiritual accessories. Budget-friendly and can be carved into any design. 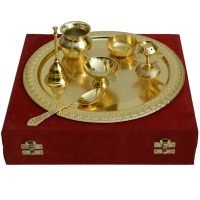 Brass Pooja Thali comes with excellent finish and enriched the Diwali environment. 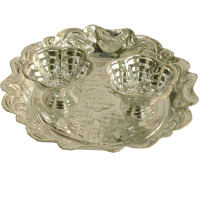 Silver: Imparts a magical glow when you put diyas. 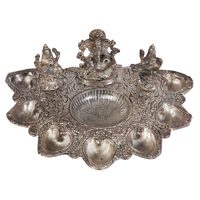 Either place beautiful Silver Pooja Thali below hanging lights and give your Pooja room a sudden jolt of lightning. 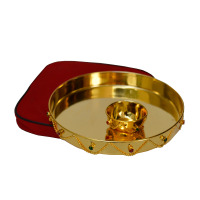 Gold: Flawless beauty and rich in designs, Gold Pooja Thali, would give your Pooja room a vibrant lavish look. German Silver: Ethnic and elegant at the same time. 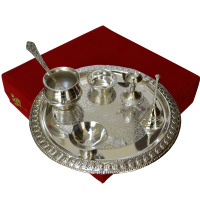 German Silver Thali is beautiful and gives your Pooja Room high glossy look. How Are Handicrafts Items Unique Than Regular Ones? 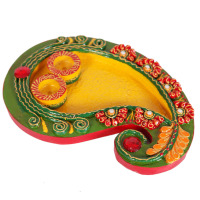 Indian Handicraft Items offer tremendous quality and more attention to details. They can take you back in the time, reflect the history and sometimes also reflect the modern age. They are unique in themselves and shows the authenticity lies in you. It reflects you are attached to your roots and in love with your heritage. Indian crafts are every time saviour when we thought to gift them on special occasions like Diwali to clients, colleagues and employees. They are lovely and much better than regular ones. 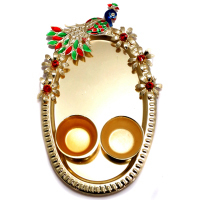 Boontoon has the widest collection of handcrafted pooja thalis. From German silver, wooden, marble, kundan to meenakari handicrafts, Boontoon presents beautiful pooja ki thali for your every occasion. 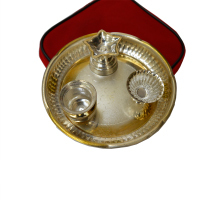 Boontoon also accepts bulk orders and deliver handicrafts items not only in India but all over the world. So give the best Diwali gifts to your loved ones with our easy and fast online gift delivery service.